I consent that Argus may use my personal information to send me marketing communications. 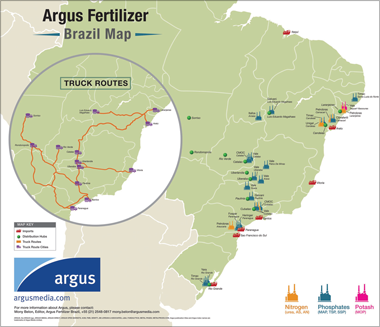 Explore Brazil's domestic fertilizer production and imports, as well as distribution hubs and truck routes. With offices all over the world, Argus offers you expert analysis of international fertilizer markets from a global and regional perspective. Download your complimentary Brazil fertilizer map today for insight into production and trade in the region – simply complete the form opposite for immediate access. © 2018 Argus Media. All rights reserved.